The first step in a successful sampling event is being sure you are using the correct method and media. WOHL has many tools to help assist you with this. Our on-line and printed sampling guides will help you select the appropriate sampling media, volumes and methods for a wide range of analyses. WOHL can often also perform analyses for methods other than those listed. Please remember that you are only a phone call away from talking to our experts in the lab at 800-446-0403. Use our powerful search engine to see the most current sampling information for the various chemicals we analyze. Often it is nice to have a printed guide to take into the field. WOHL routinely updates a printable version for your convenience. Look here for more details on the various headers found in the sampling guide. WOHL’s standard shipping is UPS ground and is included in our cost of analysis. However, we can ship using 2nd day and next day when needed. Even though we love to talk to our clients, often it is easier to order online. If you already have a WOHL company number, please use this link to place your orders. 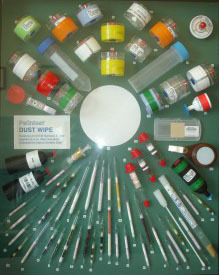 Our sampling guide lists the various chemicals that can be analyzed. However, in some cases you need additional information for a successful sampling plan. A great service WOHL provides is this free loaner pump program.